1. To prepare the trout, cut the fins off the fish. Scrape any scales from the fish by scraping a knife against the scales (going from the tail toward the head). Rinse and dry the trout. 2. To make the salad, cut the skin from the orange so that all the skin and white membrane have been removed. Cut the orange segments from the orange, leaving the membrane behind. Dice the segments and place in a bowl. Squeeze the left-over membrane to remove all the juice. Add the juice to the diced segments. 3. Combine with the orange segments, the diced tomato, red onion, lemon juice, olive oil, 1/8 teaspoon salt, and a few grinds of the peppermill. 4. Season the two trouts with 1/2 teaspoon salt and pepper, and the paprika. Dredge the trouts in flour. 5. 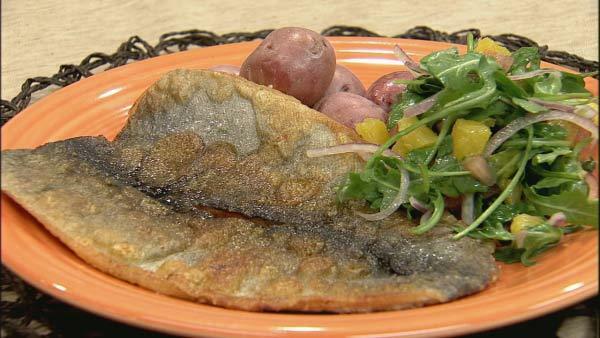 In a very hot saut� pan, saut� the trout, skin side down in vegetable oil. While it is cooking, press it periodically with a spatula to push the skin into the oil and onto the bottom of the pan. After about 5 minutes, the skin should be very crispy. Flip the fish and continue to cook for a few minutes until it is cooked through. 6. Place each trout on a plate, with the skin side up. 7. Mix the arugula with the rest of the orange and tomato mixture. Serve this salad on the side next to the trout, along with some boiled red potatoes.